Large numbers of people have taken part in a landmark vote on independence for Iraq's Kurdistan region, amid growing opposition both at home and abroad. Votes are still being counted, with a big victory for "yes" expected. 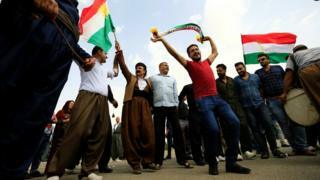 Kurds say it will give them a mandate to negotiate secession, but Iraq's PM denounced it as "unconstitutional". Neighbours Turkey and Iran, fearing separatist unrest in their own Kurdish minorities, threatened to close borders and impose sanctions on oil exports. The US state department said it was "deeply disappointed" that the vote went ahead. "We believe this step will increase instability and hardships for the Kurdistan region and its people," spokeswoman Heather Nauert said. The referendum passed off peacefully across the three provinces that make up the region, and in areas controlled by Kurdish forces but claimed by Baghdad. Turnout was estimated at about 72%, according to the electoral commission. Partial unofficial results published by the Kurdish Rudaw website show that more than 90% have voted for independence. 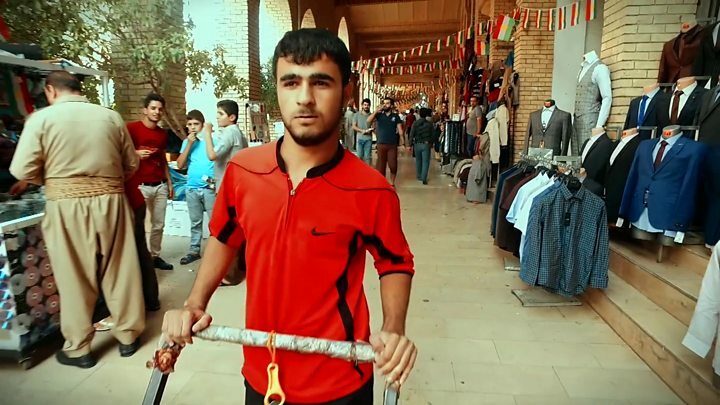 There were scenes of celebration as the polls closed in the regional capital, Irbil, and in the disputed city of Kirkuk, where a curfew was imposed on Monday night amid fears of unrest. "It's a day of celebration today. That's why I've put on our traditional outfit, which I bought for the occasion," 33-year-old Diyar Abubakr told the AFP news agency. 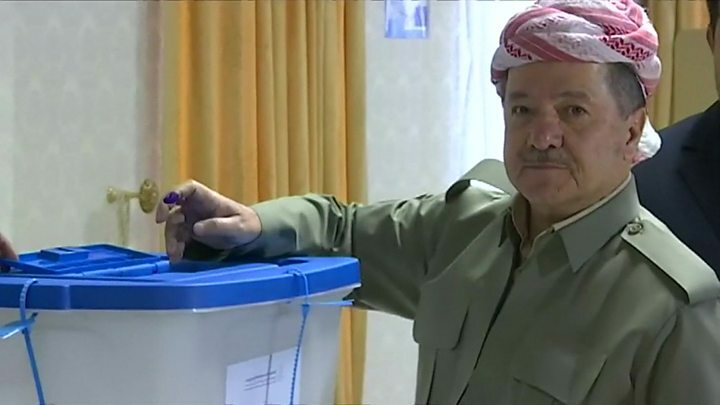 The vote is being closely watched not only in Iraq but elsewhere in the region because its implications could reshape the Middle East, the BBC's Orla Guerin in Irbil reports. Turkey and Iran fear the impact this could have on their own Kurdish communities, our correspondent adds. In Istanbul, Turkey's President Recep Tayyip Erdogan described the vote as "unacceptable" and threatened to close the Iraqi Kurds' vital oil export pipeline. "We have the tap. The moment we close the tap, then it's done," he was quoted by Reuters news agency as saying. He also said his country could close completely the sole border crossing with the region. Traffic there, he said, was currently only being allowed to cross from the Turkish side. Late on Monday, Iraqi and Turkish officials announced they would hold joint military drills in Turkey in an area bordering the Kurdish region of Iraq. Iran called the vote "illegal", having banned all flights to and from the Kurdish region a day earlier. UN Secretary General António Guterres expressed concern about the "potentially destabilising effects" of the vote. Iraqi Prime Minister Haider al-Abadi warned on Sunday that the referendum "threatens Iraq, peaceful co-existence among Iraqis, and is a danger to the region", and vowed to "take measures to safeguard the nation's unity and protect all Iraqis". But Kurdistan Regional President Massoud Barzani has accused the international community of having double standards. "Asking our people to vote in a peaceful way is not a crime," he said on Sunday. "If democracy is bad for us, why isn't it bad for everyone else?" Mr Barzani said the referendum would not draw borders, and that afterwards there could be talks with Baghdad for a year or two. But he stressed that the "failed partnership" with the "theocratic, sectarian state" of Iraq was over.